Dave & Lily are Dean Christman’s son and daughter-in-law. Our church has supported them for several years as they were on staff with Cru (Campus Crusade for Christ) most recently in San Diego. 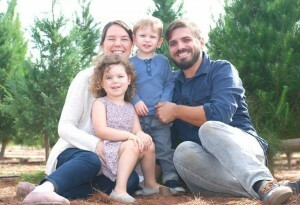 In January, they said goodbye to Cru while embarking on a new missionary adventure with The Resolved Church (www.theresolved.com) in San Diego. It is a perfect wedding of their gifts & training, passion for discipleship, and heart for orphans and foster children. We’ve been on staff with Cru (Campus Crusade for Christ) for the past 9 years. Our adventures with Cru have taken us to San Jose, East Asia, and San Diego. Our time with Cru has been both invaluable and memorable in the training and experience we’ve received. It’s bittersweet for us to say that our service with Cru [has ended], but our adventures in missions and ministry are continuing on! Although we will no longer be working with Cru, our goal remains the same – to “Make Disciples”. We will still be leading ministries of evangelism and discipleship in San Diego and around the world. Dave will be helping to pioneer missions, orphan care, and the college ministry at our church, The Resolved Church. . . We will be partnering with key gospel centered churches around the world through ongoing coaching, equipping, and empowerment. We have a heart to see churches that plant churches. Lily will be working part-time as the director of our church’s children’s ministry, and we are excited for her to use her gifts, talents, teaching credential, and training we’ve received as foster parents in this much needed area of the church. We have a lot of vision and hopes for these ministries moving forward, and are excited to use our strengths and gifts to help further God’s mission and kingdom in San Diego and around the world. We appreciate your prayers and support as we have faithfully served with Cru! . . . You have been an answer to prayer and the fuel of our ministry. It brings tears of joy to our eyes as we think of what the Lord has done over the last decade as we have labored together. Hundreds of lives have been forever changed as a result of our partnership in the gospel. As our church continues to grow, these roles are not currently fully funded, so it’s necessary for us to continue to be financially supported for the next 2 years. . . We will continue to keep you all updated on what the Lord is doing and how you can be praying for our ministry and growing family as we continue in what the Lord has called us to. . .